QSFP+ stands for Quad Small Form-Factor Pluggable Plus. A parallel and hot-swappable fiber optical module that provides high-density 40G connectivity options for high-performance computing networks and modern data centers. It has four independent receive and transmit optical channels that can terminate to another 40G QSFP+ transceiver, or can be distributed to four separate 10 Gigabit SFP+ transceivers. 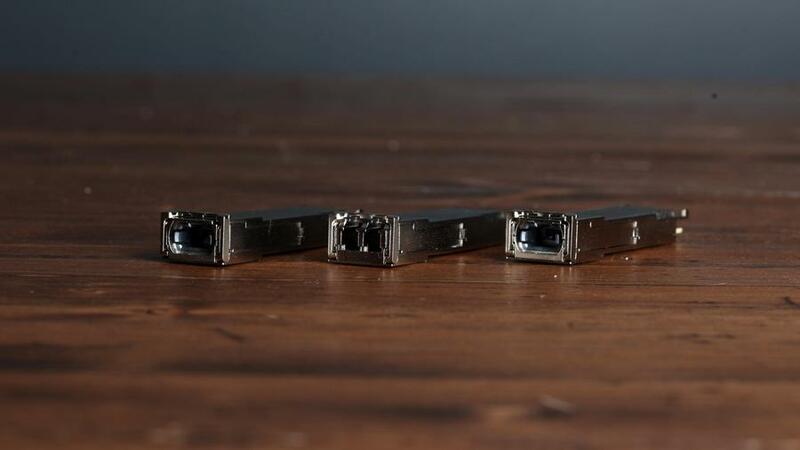 The QSFP+ modules , in a nutshell, connect the entire electrical circuitry of your system to an optical external network. 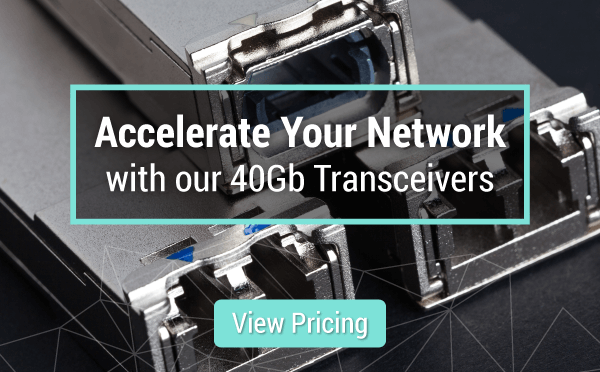 There are a variety of 40G transceivers currently available on the market. 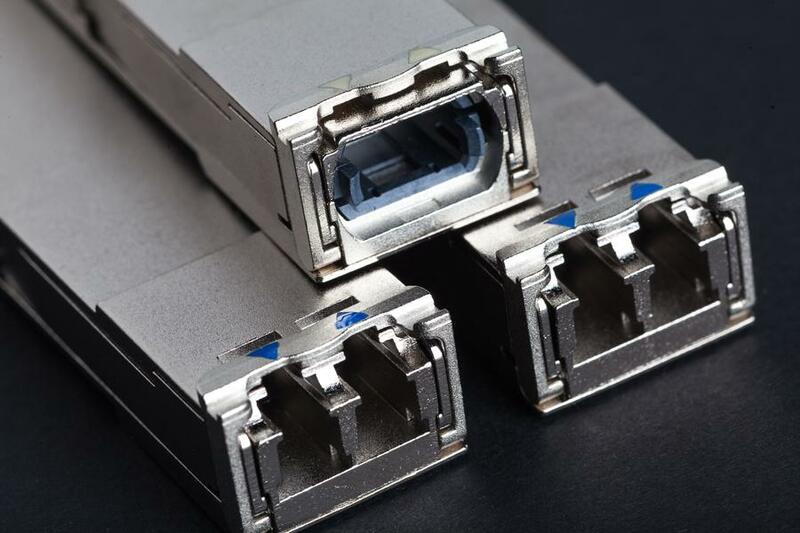 However, 40G QSFP+ optics follow the QSFP MSA standard which dictates that 40G QSFP+ connectors can be either 12-fiber MPO or duplex LC. Which are the MPO and the LC. What are the differences between these two interfaces? To put it simply, 40G SFP+ transceivers that have an LC interface are used in transmitting data over long distances via single mode fiber (SMF), while transceivers with an MPO interface (except for 40GBase-PLR4 and 40GBase-PLRL4) are deployed for data transmission over short distances via multimode fiber (MMF). In addition to that, MPO interfaced QSFP+ transceivers can be used in 4x10G connectivity using a breakout cable, compared to LC interfaced ones that can’t be divided into 4x10G since they use 4 wavelengths on one pair of SMF. Let’s delve deeper and understand how 40G QSFP+ transceivers with LC interface work. From the transmitting side, 4 channels of 10G serial data streams that have different wavelengths are sent over to laser drivers. These same laser drivers control the DML or directly modulated lasers using wavelengths. Then the DML outputs are multiplexed optically to a singlemode fiber via a standard LC connector, combining as 40G. On the receiving side, the 40G signal is demultiplexed into four separate 10G streams at different wavelengths. Each single wavelength light is acquired by a diode and amplified by a TIA and then comes out as electric data. The working principle of a 40G QSFP+ transceiver with an MPO interface can be explained by starting from the transmitting side, when it transmutes parallel electrical input signals into parallel optical signals via a laser array. The optical signals are then sent through the MPO-terminated MMF ribbon. In the other side, the receiver transforms parallel optical input signals into parallel electrical output signals using a photo detector array. Which QSFP+ Type Is Right For You? QSFP+ transceivers also come in several ratings. It is important to know which category best suits your network setup. As your partners in IT procurement, we are here to provide a series of cost-effective transceivers to meet your various network demands. Let’s take a look at them. 40GBase-SR4 is probably the most widely-used and most popular 40G transceiver for short distance transmission, mostly link lengths of 100m and 150m on OM3 and OM4 multimode fibers. It is an MPO-interfaced parallel fiber optic transceiver with a 4x10G transmission pattern. The 40GBase-SR4 can achieve simultaneous 40G signal sending and receiving with the help of four 10G SFP+ lanes in one module. You can usually see this type of transceiver being used in data centers to interconnect two switches with 12 lane ribbon cables. While the 40GBase-SR4 is used for short distance transmission, the 40GBase-LR4, on the other hand, is for long range transmission of data. Though they use the same multi-lane technology, the LR4 differs in that instead of using a single fiber strand for each lane, it multiplexes all four sending lanes onto one fiber strand and all four receiving lanes onto another single fiber strand. This transceiver type supports link lengths of up to 10kms via a single-mode fiber cable with duplex LC connectors. The principle behind the 40GBase-CSR4 module is the same as the 40GBase-SR4 in which they both have an MPO interface. The difference though, is that the CSR4 can be considered as an upgrade of the SR4 because it can support longer transmission of data. Up to 300m using OM3 and 400m on OM4. 40GBase-LR4 Lite or more commonly known us 40GBase-LR4L has the same fundamentals as the 40GBase-LR4 in that it is used for long range 40G data transmission over a single-mode fiber cable. The difference though is that while the LR4 can support link lengths of up to 10kms, the LR4L only goes up to 2kms. The 40GBase-ER4 module can handle long distance transmission of data up to 40kms over SMF fiber with duplex LC connectors. It works by converting four 10G input channels to four CWDM optical signals, then multiplexes them into a single 40G channel. On the receiving end of the module, the single 40G input is demultiplexed into four CWDM signals, then transforms them to a four channel electrical data output. In today’s high-performance data network scenarios, 40G QSFP+ modules guarantee high-density, cost-effective and low-power 40G data transmission. Understanding the different 40G QSFP+ interface, types, and applications is of prime importance when selecting the best equipment for your data facility. CablesAndKits can supply not only a wide variety of 40G QSFP+ transceivers, but also provide and help you build a reliable and easy to manage network system. With lifetime warranty, free shipping over $99, and same-day shipping if you order by 8PM EST, you’ll get more, and spend less.